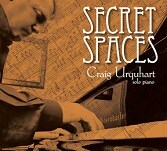 “Secret Spaces” is my favorite of Craig Urquhart’s albums so far. Check it out at www.HeartEarthMusic.com, cdbaby.com, amazon.com, and other online retailers. Very highly recommended! Having only heard a handful of Tim's previous albums and collaborations I wasn't expecting the electronica we find on Buzzle. Still present is the graceful musical craftsmanship, but this work is not especially understated and is very different to, say, the sad slow piano on The Perfect Flaw. The first thing that struck me in the opening track “Rota” is how the walking echoey guitar notes sound like the theme to an old detective series. Images of American city streets with people out for the evening also came to mind, and if you listen carefully there are conversational voices in the background. There's something indefinably off kilter about the slopey bass notes, moody percussive rhythm and drums, searing pads and effects that hint all is not what it first appears. There's a mixture of rhythm and melody dominated tracks with some beatless ambient ones. It's as though we're being shown various scenes of city life. What all tracks have in common though is a curious evocative quality, curious because it's usually difficult to put one's finger on what exactly is being evoked. The overarching quality of the album is mystery and a slightly disquieting sense of anticipation for something unstated. In the ambient piece “Otherize” crackling and then quivering notes sounding like morse code signals lead into an atmospheric section. Here heavy dull notes periodically drop into the soundscape and assorted electronic washes, quivering sound waves, and occasional tinkles paint a somewhat abstract scene. On this track -- and many others -- repeated listens will coax out more subtle details; in this respect a good pair of headphones would work best. Buzzle is an album easily enjoyed. More satisfying still is to dig below the surface to appreciate the excellent musical construction. Also, Tim's one of the few artists who can subsume gentle quirkiness and cheeky humour in the music without it sounding out of place or forced. 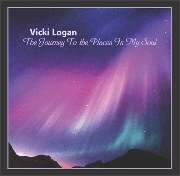 “The Journey To the Places In My Soul” is Vicki Logan’s fourth release to date. Each of Ms Logan’s CDs has taken a somewhat different approach, and this one welcomes the return of the flute to her musical palette. Along with Logan on keyboards and flute, the album features Randy Gildersleeve on guitar, Kenni Holmen on sax, Andy LaCasse on bass guitar, and Peter O’Gorman on drums and percussion. For the most part, the music is lively and upbeat, with the desire to inspire the listener to have more fun and enjoy life. Reflecting on people and events that have meant a lot to her, Logan shares a bit of her life and her soul with us in a very personal way. The stylings of the music range from pop and jazz to rock, new age, and Celtic, with some pieces fully orchestrated (electronic), others acoustic ensemble, and some a combination of both. “The Journey” begins and ends with different versions of “Twilight Dreams of Paradise.” The first one is a keyboard and sax duet that really soars with a warm and graceful energy. The closing track is more orchestrated, with Logan’s flute replacing the sax. Electric guitar and percussion give this version quite a different feeling, but both are uplifting and joyous. “Dancing With the Northern Lights” is one of my favorites. Beginning with a mysterious and open feeling of space, a simple keyboard melody brings in bass and percussion. The flute enters with a jazzy, joyous energy that gets the toes tapping. “The Promise (Part 1)” is a haunting sax solo with ambient keyboard washes behind it. “The Promise (Part 2)” is probably the most pop of all the pieces and has a frothy effervescence (and another great sax performance!). “Everlasting Memories” has a quiet, dreamy quality with the haunting flute, a flowing acoustic guitar accompaniment, and keyboard washes to give it an ethereal quality. “The Spirit of Flight” is a mysterious, rhythmic piece that effectively blends electronic and acoustic instruments while celebrating the little everyday things that go unnoticed but can actually change the course of history - or just one life. “To The Places In My Soul” has more of a jazz approach, with the flute leading the way. Percussion, guitar, and keyboard enhance the joyous mood. “The Journey To the Places In My Soul” is a fun and interesting musical excursion. It is available from vickilogan.com, amazon.com, and cdbaby.com. Enjoy! Stephan Kaske has had a long career in electronic music, going back to 1969 when he joined two other musicians to form the group Mythos. In the 1990s he started to record under the moniker M.A.S.S, initially to put his own interpretation on the music of selected classical and modern composers. 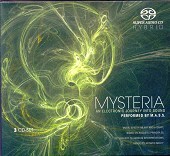 His latest release is a three CD set called Mysteria -- each consisting of five tracks -- which is best appreciated by those who have a Super Audio CD player. Not having heard any Mythos or M.A.S.S albums before I had no idea what to expect from Mysteria. I'd describe it as thinly layered synth pop ranging from some great tunes to somewhat boring ones. But across the CDs there's enough to keep the listener interested. On disc 1 the first but shortest track “Karakuri” is the highlight. Lush synth lines with a frisson like humming power lines combine with a skittering rhythm and an exotic style melody hinting at suppressed emotions. In some tracks there's a sensuousness lurking in the rhythms and melodies, and especially in “Metrosexual Zone” the aching ethnic and androgynous vocals bring out this aspect. Onto disc 2 and the sonics are familiar. Musically it's more dramatic and perhaps a little more melodic. By now there seems to be a pattern, at least for me, that the first track on each CD is the best. On “Adrenalin Hunters” it's not surprising that the music is upbeat with an infectious rhythm and melody of sparkling notes that sometimes reached an intensity like fireworks exploding in the sky. Apart from losing its way in parts this track is wonderful. By now you get the idea of how this disc set goes musically. I'd say that Mysteria fits into the well populated category of good but not great EM. Of the nearly three hours of music much of it is accessible and enjoyable enough, some is a bit boring, and a few tracks go on too long.